France declared war on freeloaders this week, as the Paris Métro cracked down on ticket fraud and the nation's newspapers formed a bloc against ad-blockers. But it seems freeloading does still pay. Ten percent or more of travelers on the tramways circling Paris don't pay, according to the local transit authority, which this week began deploying additional ticket inspectors on the three lines most affected. But the proportion of freeloaders is far higher online in France, where as many as 30 percent of visitors to news websites use an ad blocker, according to a recent survey. Now, the websites are fighting back. Unlike the trains and tramways, they don't have an army of inspectors able to enforce spot fines of €50 for those without tickets. But they can detect surfers who refuse to look at the ads and stop them from seeing the content. They can then ask them to either turn off their ad blocker or pay if they wish to see more. Although the introduction of the ad-blocker blockers seems concerted, the way in which it is implemented is far from uniform. Business daily Le Figaro says politely, "Dear reader, you are using an ad blocker: Please deactivate it to continue reading." But you can carry on regardless: Whether you turn off your ad blocker or not, the rest of the story is still visible. The site invites people to try a one-month, no-strings trial of "Le Figaro Premium," (€9.90/month thereafter) which provides access to additional paywalled stories, and turns off ads in videos. There's no word, though, on whether you still see ads around text. Le Parisien, a local newspaper for the Paris region, is more forthright: "The content of this article is inaccessible because you are using an ad blocker. 20 percent of our readers block our advertising. We would like to inform you that advertising is our main source of revenue. It allows us to pay our authors, journalists, designers, engineers and all the teams who work hard to inform you each day," it says, right after the headline. And unlike at Le Figaro, you really can't see any more. Le Parisien then invites readers to turn off their ad blocker (and tells them how), or suggests they subscribe to turn off ads. It has an unbeatable deal: €1 for the first three months. The regular print edition costs €1.20 a day. But one thing these blocks show is that even those prepared to pay for their news would do well to install an ad blocker first. Le Monde's subscription offer to those who don't use an ad-blocker is €1 the first month, and then €17.90 a month thereafter -- almost three times as expensive. Le Parisien's €1 introductory offer only lasts one month for those without ad blockers, instead of three, although both groups must pay €13 a month thereafter. 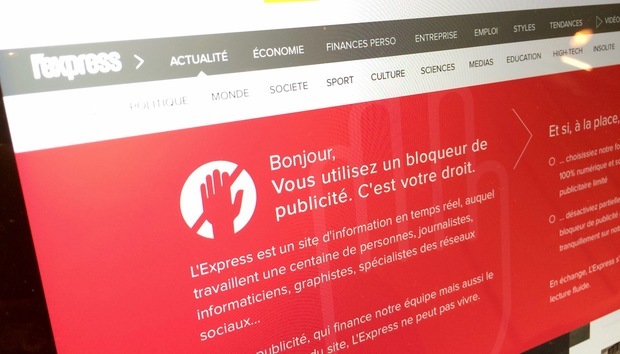 A proposal made last year to French online publishing industry group GESTE would have been even more of a bargain for site visitors. A report circulated to GESTE members and archived by Google, "Solutions to ad blockers," suggested they create their own ad-blocker that, for a fee of €6/month, would allow ad-free access to members' sites, while continuing to block ads (or be blocked itself) elsewhere. And how about the transit freeloaders? A monthly pass costs €70 or more, so those caught without a ticket once a month or less would seem to be better off paying the €50 fine and taking a chance. Some kinds of uncivil behavior, while not quite crime, do pay. Is the world ready for the end of Excel?